« Twittering from the IBM i? 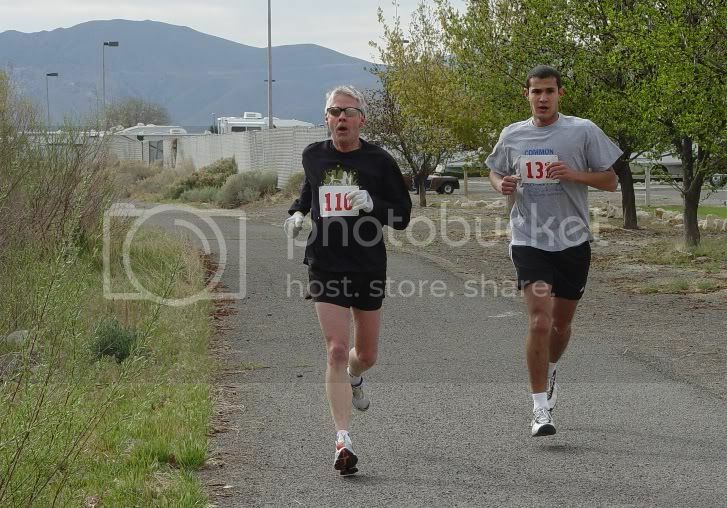 I awoke today in Reno, Nev., to register and cheer on the participants in COMMON User Group‘s first 5k run/walk for charity. Some were surprised by the brisk morning air, but the 20+ who participated enjoyed the opportunity to get out of the confines of the Grand Sierra and stretch their legs for a good cause. First place runner Hany Elemary of Profound Logic Software (right), and event organizer, ringer and marathon runner Dan Kimmel (left), RJS Software and COMMON Treasurer finish up the last portion of the course near the Truckee River before heading to the finish line. I stood somewhere close to the 4k marker and cheered on the participants while visiting with a couple of attendees who had volunteered to help monitor the course. As we were walking back, I found out I was talking to IBM i educator, Jim Sloan, who shared that his newest CL programming book was published in January. For my networking purposes, this was perfect, and we discussed getting a chapter excerpt for publication on Search400.com so you to get a preview of this resource. Based on some of the reader questions I receive, I know some of you may find this book really helpful. Speaking of resources, I needed to see what sessions I should check out at the meeting, and started looking through the ambitious schedule of 500 educational events. Some at COMMON have used the term “technical information fire hose” to describe the event, and I have to say, it’s a fairly accurate analogy. I sat down to plot my course for Monday and discovered that there are two dozen concurrent sessions during each time block to choose from! So far, the meeting has been a great opportunity to put some faces with names and to learn more about what people are doing in this community. I had the opportunity to meet with Philip Roestamadji and Alex Roytman of ProfoundLogic Software to discuss their new educational initiative, Profound Logic Software TV. The pair explained that the videos on the site will focus on summarizing and clarifying trends, ideas and technology for the IBM i based on the knowledge and information they have gained in conducting their business. The site emphasizes viewer interaction, with a request for viewer input on current and future content (including special requests). I cynically wondered what was in it for them, and it pretty much comes down to feeling good about sharing what they know with others. We’ll be sure to follow their activities, and let you know how you can get involved if you’re so inspired. Educational Excellence: Metropolitan Community College, Omaha, Neb. Web Solutions: Allied Beverage Group, Carlsbad, N.J.
Business Solutions: Fashion Institute of Design and Merchandising, Los Angeles, Calif.
Jeff Howard, IBM POWER Systems Marketing spoke in place of Ross Mauri, IBM General Manager, POWER Systems, who was stuck in Chicago due to weather delays at the airport. Howard shared IBM’s Dynamic Infrastructure initiative, walking attendees through the ways that IBM i fits into the campaign’s vision for a smarter planet — sharing the POWER systems virtualization, energy efficiency, business resiliency, and management tools. Howard also previewed the hardware releases the company will announce on Tuesday (BladeCenter JS23 and JS43 Express and Power 550 and Power 520 updates)… stay tuned. The keynote at the end of the opening session was delivered by Jeff Jonas, IBM Distinguished Engineer and Chief Scientist, Entity Analytic Solutions, IBM Software Group. Jonas captivated the audience with discussion of next generation data management, mixing humor and humility with highly technical descriptions of how different data bits can be connected to find unknown relationships, solving real problems including fraud in casinos to terrorist actions. First, I met with AdventureTech Group’s president, Doug McDaniel, and director of sales, John Patsch. They explained the features of iSafari, a Web-enablement tool. Next, on the PHP side, I met with Marcel Sarrasin of BCD who demonstrated the company’s WebSmart PHP tool.